MINNEAPOLIS--(BUSINESS WIRE)--Mar. 13, 2019-- Graco Inc.(NYSE:GGG), a leading manufacturer of fluid handling equipment, is proud to announce the launch of the new LineLazer® V 200MMA 1:1 airless line striper. MMA (methyl-methacrylate) is a two-component, durable pavement marking material that provides increased durability and life. This newest addition to the LineLazer family brings MMA applications, using a 1:1 component mix ratio, within reach of everyday striping contractors. The LineLazer V 200MMA 1:1 line striper provides a superior, compact and affordable solution for the full range of MMA applications – from high-traffic intersections to bike paths to city streets. To improve application efficiencies, the exclusive mix-at-the-gun technology found on Graco’s Fusion® Gun delivers faster purge times while eliminating the hassles and costs of on-board solvents. At the heart of the system, a unique flow divider ensures proper material ratio and fast line curing. In addition to these new innovations, the LineLazer V 200MMA 1:1 benefits from past LineLazer V innovations which provide quick and easy gun adjustments and automatic line production capability, including skip lines. Real-time job performance data for proof-of-job requirements is also provided along with superior bead application capability. “MMA is a growing segment in the line striping market and up until now, the only solutions were costly, complicated systems. With Graco’s new LineLazer V 200MMA 1:1, applying MMA materials is as easy as applying single-component materials,” said Mike Vangstad, Global Product Marketing Manager for Pavement Equipment at Graco. 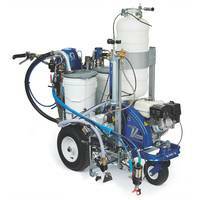 To learn more about the LineLazer V 200MMA 1:1, visit www.graco.com/LineLazerV200MMA.